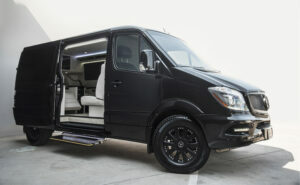 At Bespoke Coach, we consider the Mercedes Sprinter to be a blank canvas ready for a makeover – all we need to get started customizing are your unique specifications. Before we kick off the actual customization process, we want you to be informed as possible, which is where our online Bespoke Coach Custom Builder comes in. The Builder gives you a comprehensive and transparent look at all your options. Complete with detailed feature lists and pricing for optional upgrades, you know exactly what you’re buying before you even pick up the phone. The exterior section of the Builder provides an overview of the coach and entertainment features that come standard with your custom Mercedes Sprinter van. First, you can choose your preferred van size: a 144-inch wheelbase 2500 Sprinter Van chassis with a standard roof, or a 170-inch wheelbase with a high roof. Then, select from a black, silver, or white van color. The next step involves looking at your grille options – an OEM plastic grille comes as standard, or you can upgrade to an OEM chrome grill or Bespoke chrome mesh. For wheels the OEM 16-inch wheels are standard. Although you can swap those out with gloss black powder-coated OEM wheels or Bespoke 18-inch wheels and tires depending on the size of the van. Photos of each choice are available so you can picture exactly what your Mercedes Benz luxury coach will look like every step of the way. Custom-paint the side plastic moldings, front and rear bumpers, and side-view mirrors to match the body color you chose. Add 3M® Crystalline window tint to cool the interior of the van by up to 15 degrees Fahrenheit and reduce incoming UV rays by 99%. Custom-install LED Daytime Running Lights in the front bumper air intakes. Include a motorized sliding door operated by exterior and interior door handles, interior installed switch, or Mercedes key remote. Add a motorized entrance step with LED lights. Install Battery Tender, which maintains the battery of your vehicle when left unused for long periods of time. 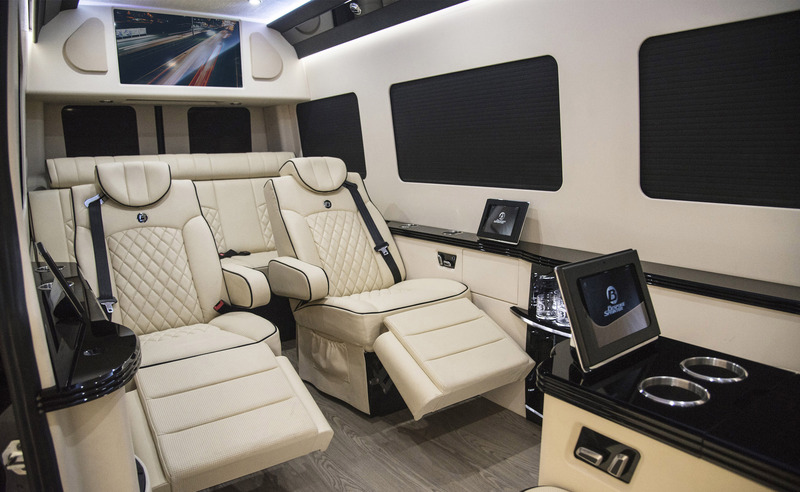 Designing the interior of your personalized Mercedes Benz coach is arguably the most enjoyable part of the process. You can select from 15 color choices for the: ceiling, ceiling valance, upper walls, lower walls, covered grilles, seat faces, seat sides, seat stitching, seat piping, and seat belts, as well as a smaller selection of options for the shades and trim. For the floor you can warm up the space with our Red Cherry or Red Mahogany options, or opt for dark sophistication with our Espresso Oak and Oak Black choices, among others. This is also the stage at which you decide if you want to add an in-wall trash bin and molded mini bar, and whether to go with the standard center console or upgrade to include four storage drawers or a Nespresso machine. Once you’ve entered your interior design specifications, it’s time to turn your attention to the driver zone of your custom Mercedes Sprinter. The Mercedes factory radio comes as standard, but you may wish to upgrade to a 6-inch touch screen radio (complete with AM/FM Radio, iPod/Bluetooth/DVD player, and backup camera) or the Alpine® 8-inch touch screen navigation, which boasts all of the 6-inch touch screen radio’s extras plus a navigation feature. Reupholster the Mercedes fabric headliner and pillars with Alcantara® suede. Replace the Mercedes vinyl plastic flooring with Mercedes velour carpet flooring. Add piano-black accents on the steering wheel, door handles, and dashboard trims. Upholster the front seats in your color choice. Install the HomeLink® garage door opener, which comes with three buttons can be programmed to perform a range of functions from opening gates and doors to controlling lighting. Upgrade to Focal® coaxial speakers. 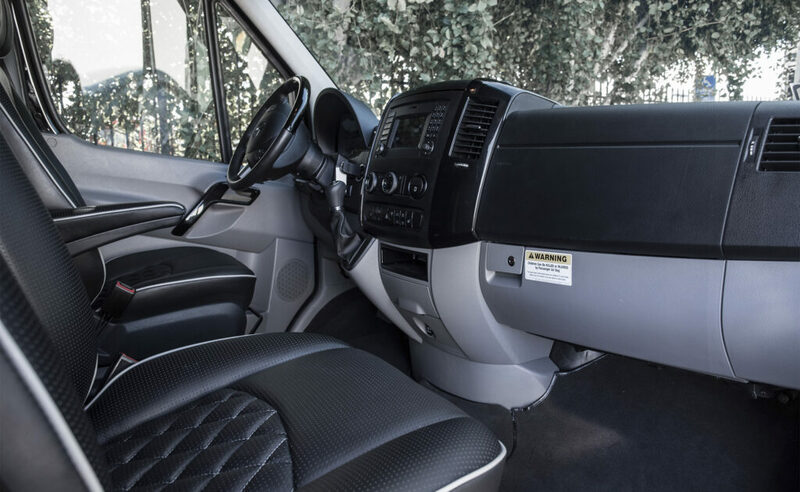 With the driver zone squared away, the next step is to make some design decisions about the passenger zone of your luxury van, where you’ll likely be spending the majority of your travel time. In terms of seat upholstery, you may choose between standard Mercedes leather and premium Bentley/Ferrari leather, while your interior wall and ceiling upholstery options range from standard Mercedes vinyl to Executive Aviation Ultraleather. 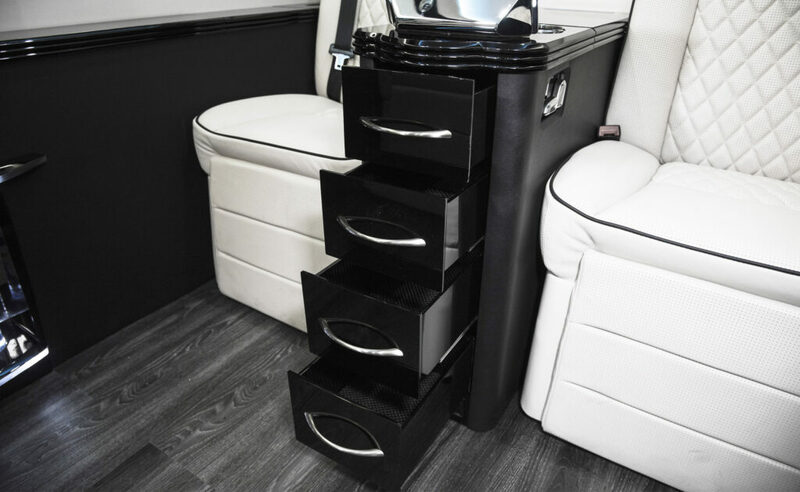 Additionally, you can select whether to go with the basic front center console, add four storage drawers, or go with a trash can and a Nespresso machine that comes complete with a drawer for machine capsules, cups, and supplies. Install a rear-zone air conditioner and heater with six adjustable vents, controlled through the Bespoke iPad app. Add motorized window shades that can be controlled through the Bespoke iPad app. Install a Plexiglas molded minibar with LED lighting and space to hold six monogrammed glasses on the top shelf and three bottles on the bottom shelf. Add a digital temperature-controlled refrigerator/freezer unit in the front center console. 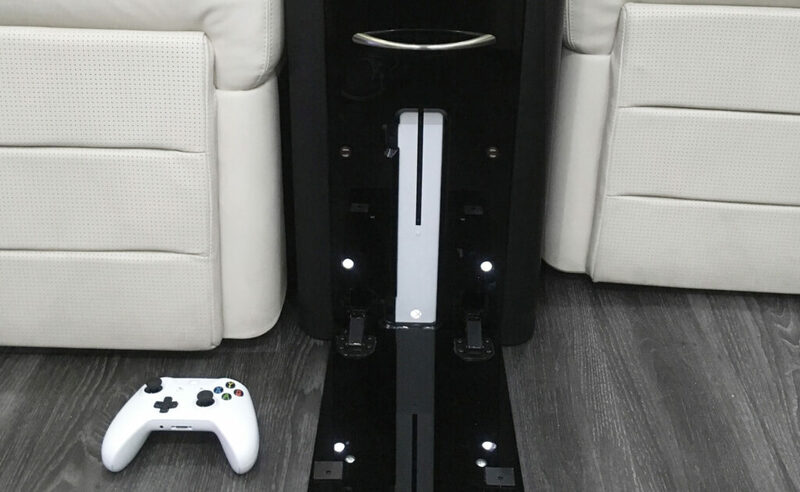 Add built-in motorized pop out laptop tables for the rear recliners. Install two 100-Volt dual outlets with built-in USB charging capabilities on the driver and passenger sides. Add a two-way passenger/driver intercom, controllable through the Bespoke iPad app. Upgrade the piano-black countertops and valance trim to have a burl wood, maple, or carbon fiber finish. Focal® Audiophile sound system, including eight speakers, two subwoofers, and two amplifiers totaling 1,800 Watts of power. Tracvision® Satellite Receiver for DirecTV® with custom roof mount (requires monthly subscription). Movie Server with room for up to 200 DVDs 80 Blu-ray discs, controlled through the Bespoke iPad app. Blu-ray player controlled through the Bespoke iPad app. Apple TV controlled through the Bespoke iPad app. HDMI Auxiliary input wall outlet controlled through the Bespoke controller’s iPad interface. Front view camera that displays a view of the road via the Bespoke iPad app. 4G LTE cellular router with a low-profile, performance-increasing roof antenna (requires monthly subscription through either AT&T or Verizon). The last stage of the online building process is also the easiest. To receive a comprehensive quote for the custom Mercedes Sprinter you’ve just created using the Bespoke Coach Custom Builder, fill in your name, phone number, and email, and we’ll be in touch to help turn your virtual design into reality!